When it comes to big performance, Castle believes it’s “go big or go home”! And when it comes to massive power for 1/5th scale vehicles, the Castle Creations 2028 motor isn’t going anywhere but to the top of the mountain. Castle's engineers saw the need for a robust, high-efficiency brushless motor that would hold up to the heavy throttle and extended usage that 1/5th scale vehicles like the HPI Baja 5B and 5T encounter. Even though the Castle 2028 has been around for a while, our engineers and product development team are never satisfied. That’s why we’ve taken an opportunity to make some performance-enhancing updates to this massive motor. • Revised stator and magnet shapes provide lower cogging torque for improved starting performance. • The new 800Kv rating will make the setup faster. • Rated at a higher RPM (45,000) due to improved manufacturing processes. • Capable of operating on 12S. The end result is an “enhanced” Castle 2028 that now carries an 800Kv rating. These “go big” motors can easily run in the 10 horsepower range* - how much do you think that Fuelie 26S is putting out? Burst power output for durations typical of vehicle acceleration. • Sealed motor for survival in the dust and dirt that Bajas call home. • Four-pole design with 180C temperature rated magnets. 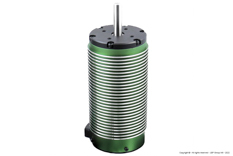 • Highly-advanced slotted stator design made of the highest quality laminations. • Heavy-duty 8mm shaft - no worries of breaking this shaft. Are you prepared to go big? Really BIG? Have you ever seen a 1/5th scale Baja doing 70 mph? Get ready, go do it, then do it again… and again with a Castle 2028 and Mamba XL2 controller.